December 1, 2017 "Instructions For Irs Form 8962 - Premium Tax Credit (ptc)" contain the updated filing procedures for the IRS-issued Form 8962. Download your copy of the instructions by clicking the link below. IRS Form 8962 is a tax form issued by the United States Internal Revenue Service. the Marketplace include the following. Moving to a different address. Gaining, losing, or other changes to employment. certain eligible taxpayers and their qualifying family members. instructions to clearly distinguish APTC from PTC. with the cost of insurance. expenses, including premiums for Marketplace health insurance. Healthcare Hotline for ACA questions (1-800-919-0452). additional guidance on QSEHRA coordination with the PTC. 8962 to compute and take the PTC on your tax return. were published, go to IRS.gov/Form8962. You are taking the PTC. your tax payment or increases your refund. forms to file, see Tax Topic 352 at IRS.gov/TaxTopics. 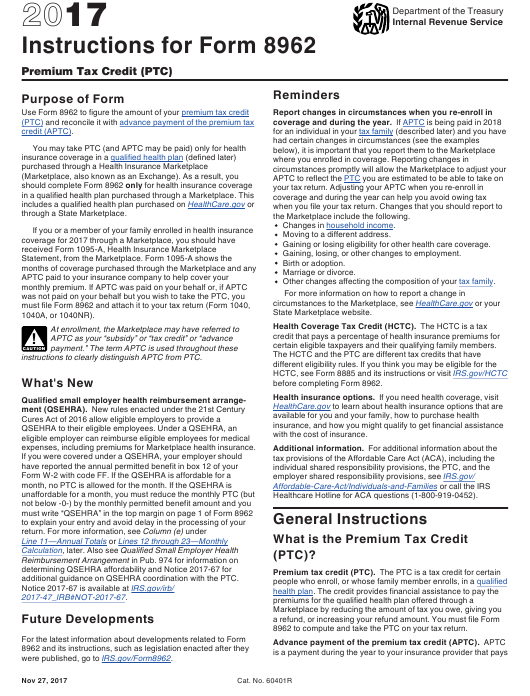 year, earlier, for changes that can affect the amount of your PTC. deducting medical expenses as an itemized deduction, see Pub. for your coverage. You do not need to file Form 8962.
early February, contact the Marketplace. should provide a copy to other taxpayers as needed. previously received Form 1095-A to complete Form 8962.
policy shown in Part I of the corrected Form 1095-A. and enter “premium tax credit” in the search box. at the end of these instructions. allowed a monthly credit amount for the coverage for that month. month for purposes of computing your monthly credit amount. instructions on completing Form 8962.
treated as paid by you. premiums, you are not allowed a monthly credit amount. refund of withheld income tax or estimated tax. 1-2, later, to determine your modified AGI. or blank or may report your applicable SLCSP premium as -0-.
the child’s social security benefits that is not taxable. have to request a corrected Form 1095-A from the Marketplace. individual market), he or she is not part of your coverage family. the individuals included in your coverage family. Employer-Sponsored Plans in Pub. 974. Employer-Sponsored Plans in Pub. 974 for more information. that the individual may have been eligible for Medicaid or CHIP. other forms of government-sponsored MEC, see Pub. 974.
on how to use Form 1095-C.
market outside the Marketplace does not qualify for the PTC. coverage that are recognized as MEC. victim of domestic abuse or spousal abandonment. to claim the PTC on your 2017 return. However, the amount of APTC you have to repay may be limited. name that appears first on your return. Exemptions, Standard Deduction, and Filing Information. form should match the social security number on your tax return. security number that appears on your tax return. (ITIN) on your tax return, enter this number on Form 8962.
the filing status of married filing separately. one of the following applies to you. instructions for Form 1040 or Form 1040A. You Single or Married? in the instructions for Form 1040NR. examples of what documentation to keep, see Pub. 974.
and take the PTC for 2017 if all of the following apply to you. the form to determine how much you must repay.